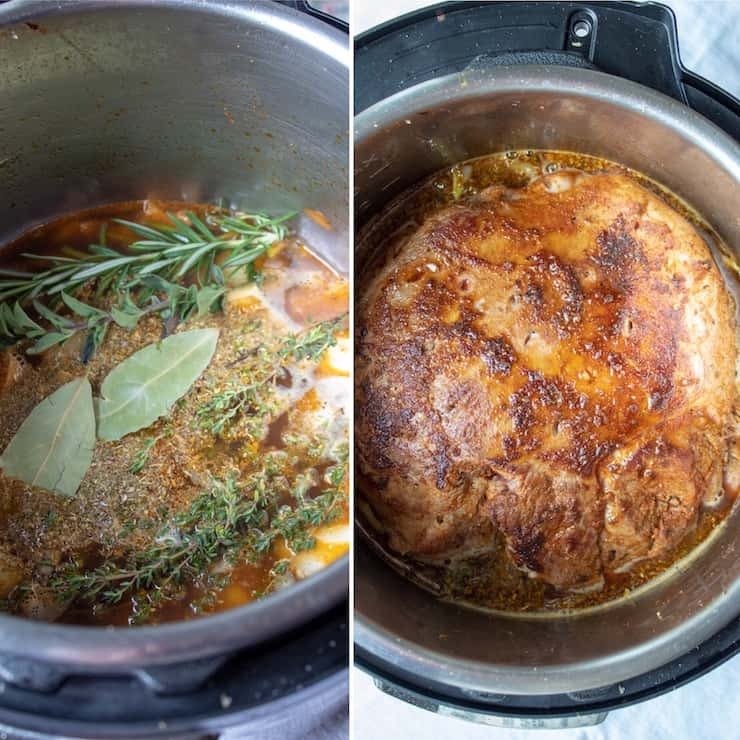 Instant Pot leg of lamb, slow roasted flavor and fork tender lamb in half the time. 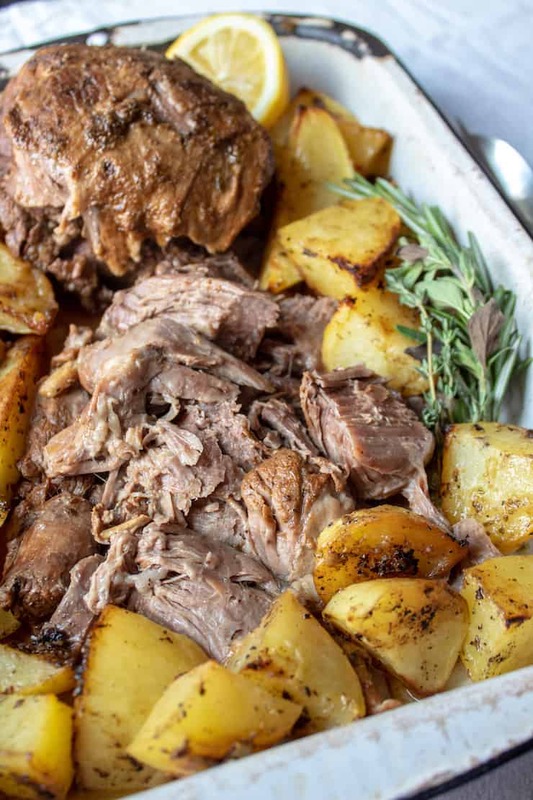 This Greek-style lamb has all the flavors you’d expect ~ garlic, lemon, oregano, rosemary and thyme, braised in the Instant Pot with wine and stock. Serve with some Greek potatoes and pan juices, no thick gravy here. Perfect for the Easter table, Sunday supper or any other special occasion. Roast lamb is kind of intimidating, at least I think so. My dad, the great cook that he was, made it occasionally, and while it usually was very good, sometimes I found it a little too, well, “muttony”. My parents also took us out to eat all the time, all over Chicago. You know where the lamb was always great? Greek Town. Always tender and garlicky and lemony. The Greeks know how to do lamb, that’s for sure. 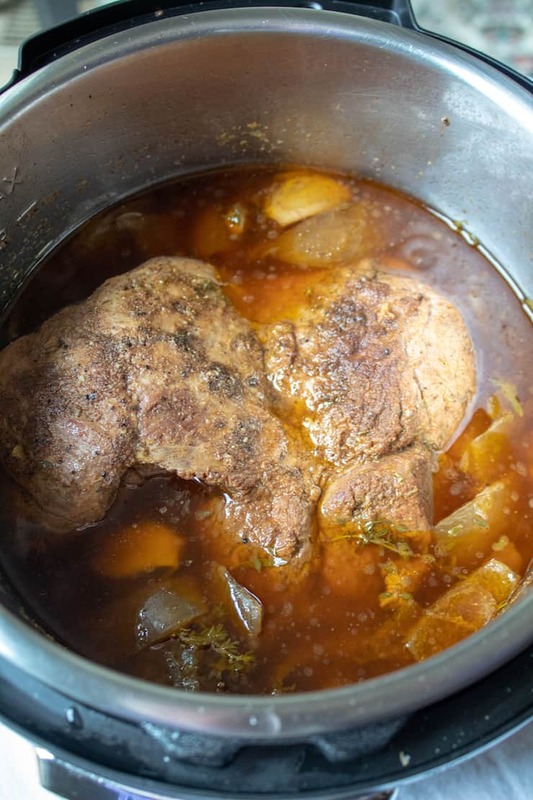 After making my corned beef in the pressure cooker this year, and loving it, I decided to try a boneless leg of lamb for Easter. And with a Greek flavor profile that could compete with my favorite Greek restaurants and Greek friend’s home cooking (her pastitsio is to die for!). I think I found it with this recipe. 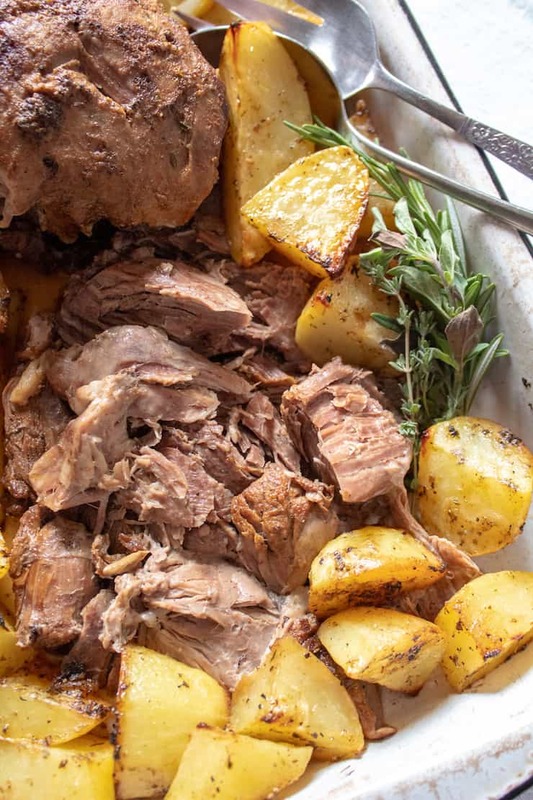 First off, this is not pink slices of lamb roast, this is unabashedly well-done ~ fall apart tender, juicy and flavorful, not at all tough and dry. Think pot roast, served with pan juices, not gravy. It’s lovely this way. Let’s talk boneless leg of lamb for a second. I use about a 4 to 4½ pound roast that comes in a mesh-string bag to hold it’s shape together because, well, the bone was removed. 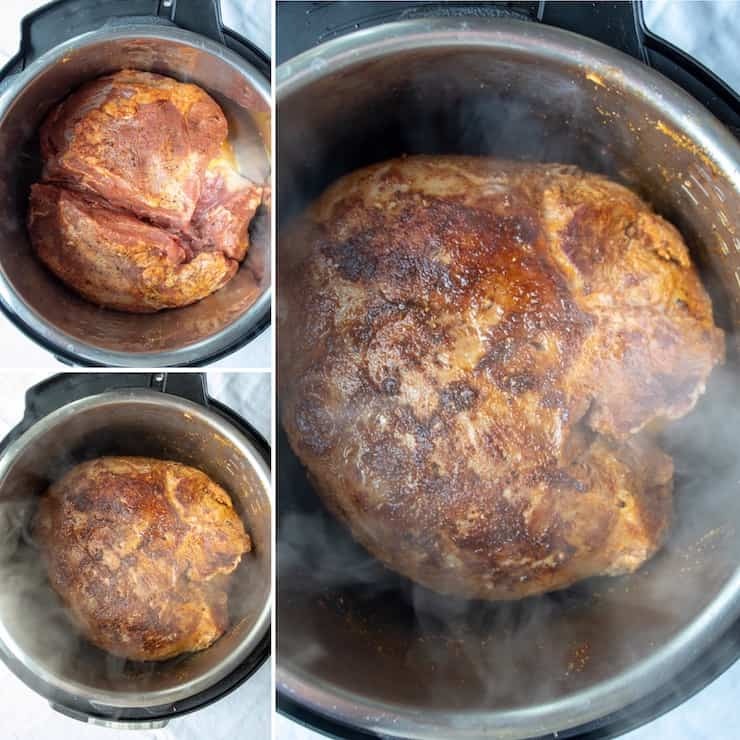 I remove the mesh to brown the roast really well and I find you can just reshape it for the Instant Pot, no worries here. Like I said, this is more of a fork tender pot roast, not carved slices of lamb. Season the lamb with paprika, garlic, salt and pepper. Cut slits all over and insert slivers of garlic. Heat some olive oil on sauté setting and brown the lamb roast all over. Remove the lamb, toss in some onion and garlic and cook to soften. Deglaze the pot with some white wine. Add some more liquid, chicken stock. We’re getting there. Turn off the sauté setting and add some more stuff. Lemon juice, fresh thyme and rosemary sprigs, fresh oregano, more dried oregano and bay leaves. Return the lamb to the pot, seal and cook under high pressure for 90 minutes. Remove the lamb to a cutting board. Strain the cooking liquid and skim off quite a bit of the fat. You now have the flavorful juices to spoon over the succulent, tender lamb. I like to serve with Greek potatoes that I roasted in olive oil, lemon, oregano and some chicken stock in the oven until golden brown. 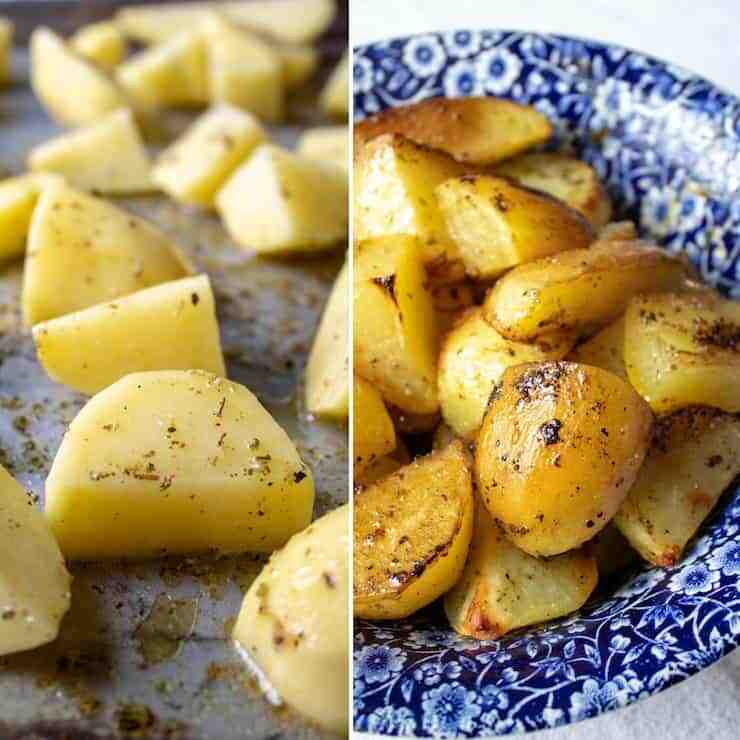 Click here for how to make Greek potatoes like I did. Leftover lamb… try Leftover Lamb Flatbreads! 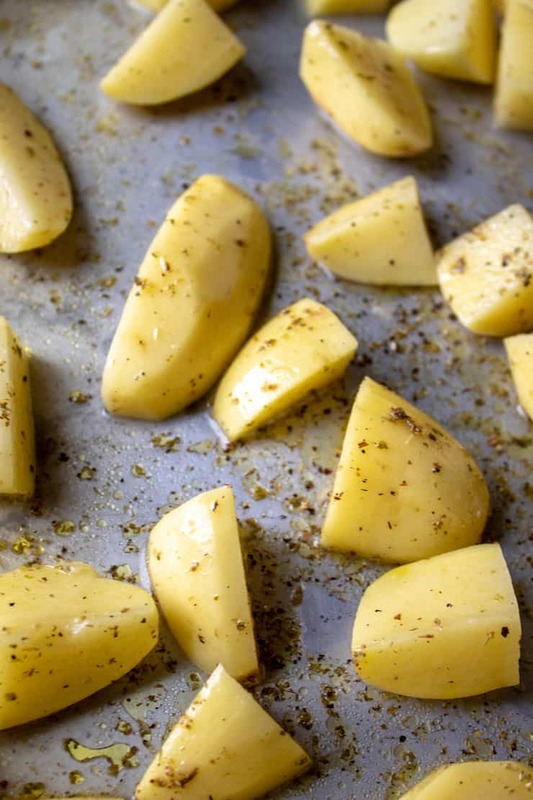 This is the advice and method I followed for making Greek potatoes. This time I made some gyros sandwiches with the leftover lamb. It is easy to slice after refrigeration. I just heated up some of the rendered fat and browned several slices in it, along with some of the pot juices. 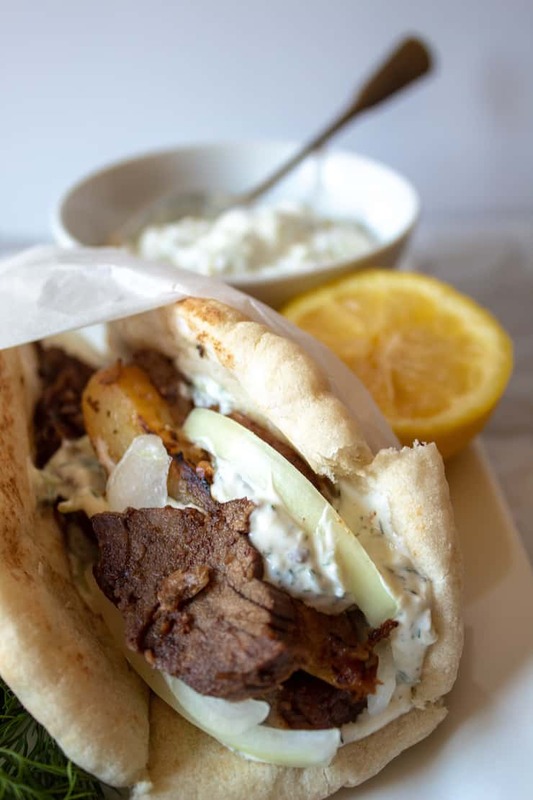 Pile the browned lamb on warm pita with onions, tomato if you have it, and some tzatziki sauce. You can use store bought for sure, but here’s an authentic and easy recipe for homemade tzatziki that I used. I also popped some leftover potato in the sandwich for good measure, never saw that in Chicago but it’s a thing in some places! 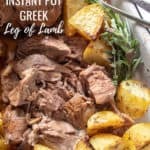 If you’ve tried this Greek Instant Pot Leg of Lamb, please rate it below in the comments and let me know how it went ~ I love hearing from you! HUNGRY FOR MORE? Subscribe to my Newsletter and come hang out with me on PINTEREST, INSTAGRAM and FACEBOOK for all the latest updates. 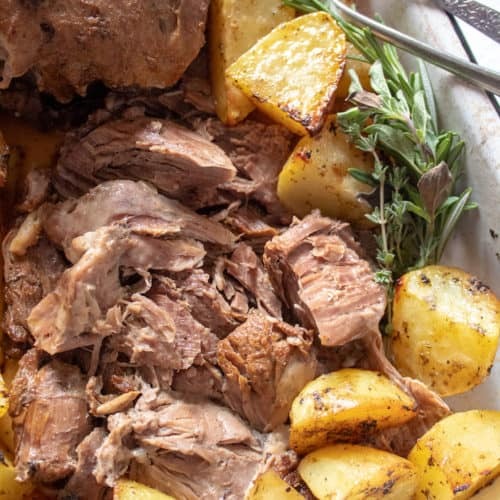 Greek-style boneless leg of lamb in the Instant Pot, fall apart tender, serve with flavorful pot juices and Greek potatoes for Easter or any special occasion. With a sharp paring knife, pierce lamb and make a hole, slip in a sliver of garlic. 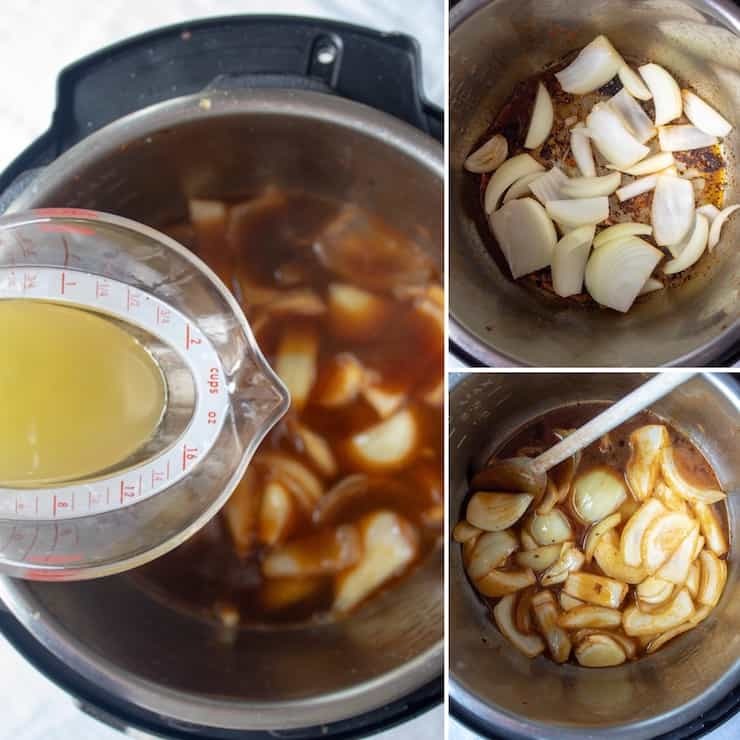 Repeat and insert as many slivers of garlic as you can, evenly distributed all over the roast. Drizzle the lamb with a little olive oil, season all over with the garlic powder, paprika, salt and pepper. Heat 1 tablespoon of olive oil in the insert on the sauté setting until hot. Add lamb and brown well on both sides, 4 to 5 minutes per side. Remove lamb to plate. Add onion and cook until starting to soften. Add a couple whole cloves of peeled, smashed garlic and cook until fragrant. Add wine and deglaze pan, stirring up any brown bits and reducing by about half. Turn off sauté setting and add remaining ingredients; chicken stock, lemon juice and herbs. Give a quick stir to combine and place lamb roast back in pot, seam side down. The liquid should come up the sides but not completely submerge the roast, about 2¼ to 2¾ cups, add more stock or water, if needed. Seal electric pressure cooker and cook on high for 90 minutes. Let pressure release naturally for 20 minutes, then release any remaining pressure manually. Remove lamb to cutting board, rest 10 minutes. Strain pot juices and skim any excess fat, taste for salt and pepper. Shred/cut lamb into slices/pieces and arrange on platter. 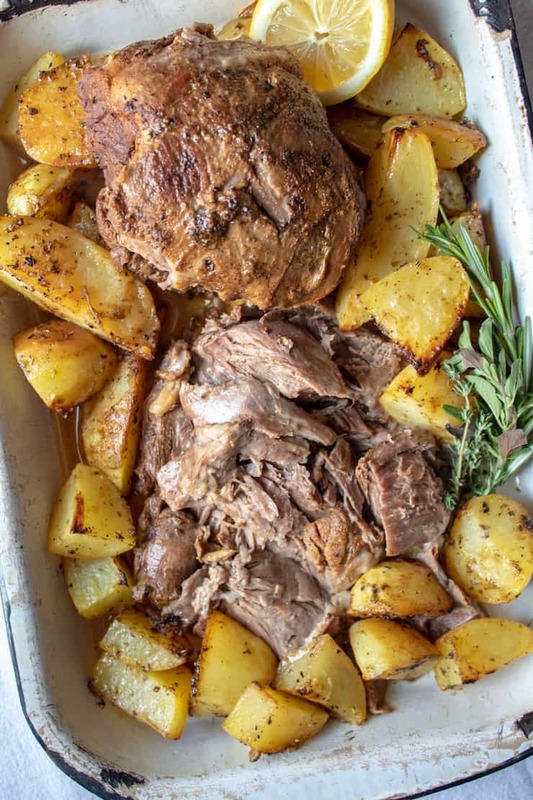 Surround with roasted potatoes and spoon defatted cooking liquid all over lamb and potatoes. Enjoy! *Inspired by Kalofagas, RecipeTin Eats and Dad Cooks Dinner. Leg of Lamb made easy for Easter.